Note: This post is written base on the dining experience in Orchard Gateway branch. Experience may vary from that of other outlets. 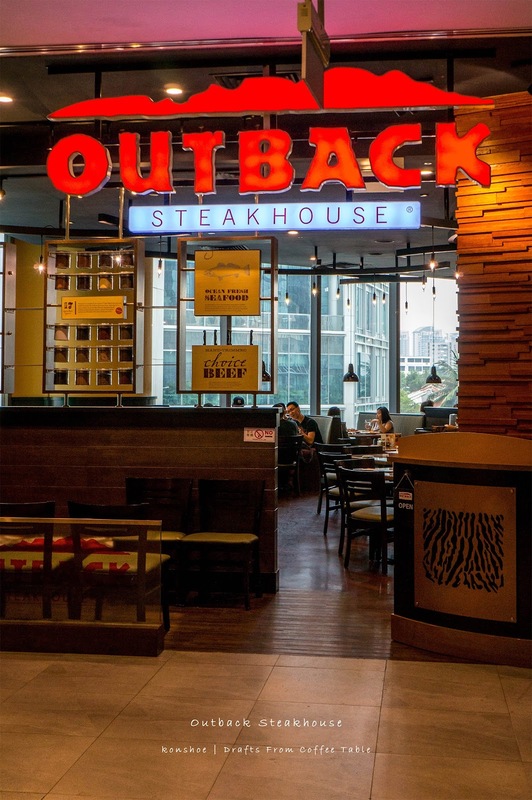 We came across Outback Steakhouse's offer while surfing Groupon, which was how we were introduced to its existence. Its branch in Orchard Gateway is out of the usual foot traffic but at a corner of the building which affords a great view across the Orchard area if you choose to be seated near the windows. The service we received in Outback Steakhouse was not bad although it can be difficult to wave a waiter over. Being a steakhouse, their signature dish is naturally steaks of all types, but our Groupon voucher limits our choices to 3: Toowoomba Chicken (SGD24.90), ribs and chicken combo (SGD34.90), and Black Pepper Steak Bites (SGD24.90). We had enough vouchers for 3 persons so naturally we chose all 3 to try them out.